In January, I want to hit the ground running with a community-based policy plan that is informed by neighborhood visioning sessions. As a part of these sessions, Jessica will partner with a group of organizations to provide insight on the issues being discussed. Among the partners for these Visioning Sessions are: Riders Alliance on transportation, Make the Road Action on immigration, Woodside on the Move on tenant issues, our UFT District Representative on public schools, and Plaza del Sol on healthcare. Although partners will attend the Visioning Sessions, each gathering will be primarily a community event. A chance for residents to voice their concerns and priorities. Community members will lead these discussions, and provide the narrative through which Jessica shapes the policies she will champion on the State Senate. Jessica Ramos is running to bring real, progressive change to Albany. While our current State Senator works with Republicans to keep Democrats from power, Jessica will work in lockstep with the Democratic Caucus to fix our subways, reform rent laws, & fund our public schools. Our subways and buses must run on time. A lifelong straphanger, Jessica lives this MTA crisis along with all of us. The State controls the MTA budget and policies, and we need a strong voice like Jessica’s in Albany to fight for a subway system that actually works. Jessica will push the MTA to be more transparent in their spending, and advocate for elevators in every station to allow senior citizens, people with disabilities, and parents with strollers easy access to the platform. Flashy countdown clocks don’t solve problems—real State funding and systemic repairs do. Jessica will fight to strengthen rent laws and keep apartments affordable. Right now, Albany controls rent laws—not the City of New York. Jessica will fight to give New York City back the power over its rent laws, reform the Major Capital Improvements (MCI) law, and get rid of the preferential rent scam. Jessica also wants to repeal vacancy decontrol—so rents stay affordable even after a rent-stabilized or rent-controlled tenant moves out. Jessica will also fight to ban the vacancy bonus that gives landlords a 20% increase in rent each time an apartment turns over, rewarding landlords for harassing and evicting long-term tenants. These are the most effective ways to preserve New York City's dwindling affordable housing stock. New York City public schools—especially those in communities of color like our district—are owed nearly $4 billion dollars in foundation aid by the State of New York. The State refuses to pay this money. As your state senator, Jessica will fight for the money our schools are owed—and for a school system that works for every child, in every school, in District 13 and across the city. The Independent Democratic Conference (IDC) is a coalition of eight State Senators who were elected as Democrats but concede power to Republicans. And our district’s senator is one of the Senators working with Republicans instead of his own party. The Republican Conference is in power because they have his vote. Now more than ever, State government should be our defensive line against the Trump White House. Instead, our state senator is siding with Republicans to block legislation for single-payer healthcare, the DREAM Act, the Reproductive Health Act, and more. Jessica is a real Democrat—and unlike our current state senator, she will vote with the Democratic Party. Small business owners are the backbone of our city’s economy. Yet in the age of chain stores and online shopping, fewer small businesses are able to keep up. Jessica will fight for small business owners, and help small businesses thrive in the face of chain stores that are expanding across our economic corridors. Jessica knows we must protect our small businesses from unfounded complaints, and ensure they maintain a clean record when no violations have been found. The daughter of formerly undocumented Colombian immigrants, Jessica knows New York City is strong because of our immigrant communities. From her first job at an immigrant rights law firm to her most recent role as New York City's chief Latina spokesperson, Jessica has always used her voice to empower immigrants and protect their rights. With a bigot in the White House, only a strong state government can protect our immigrant communities against attacks. Jessica will fight to pass the State Dream Act and the Liberty Act—and she will stand up for DACA recipients. Jessica supports drivers licenses for undocumented New Yorkers, and she believes we must keep New York City a sanctuary city to protect undocumented immigrants from aggressive persecution. 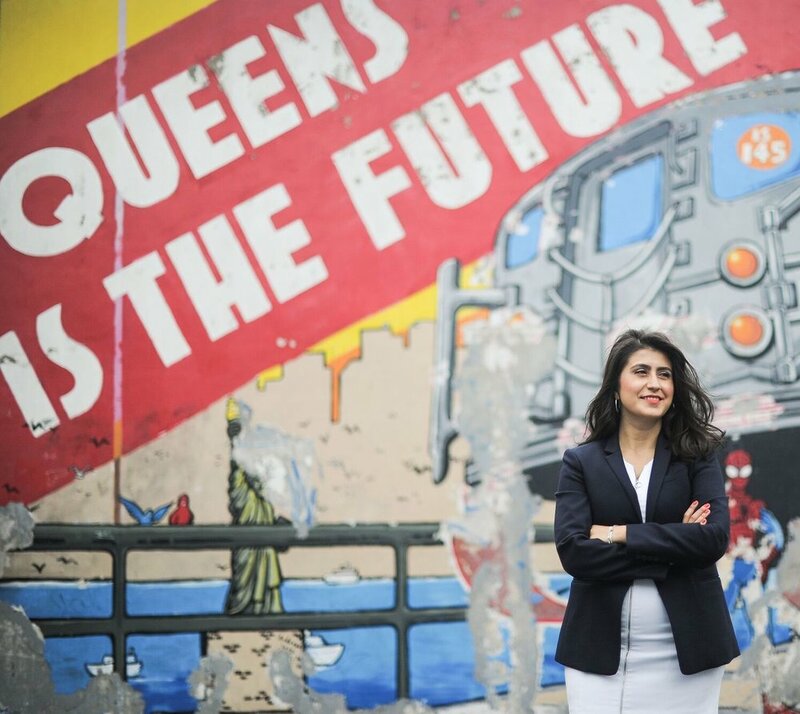 "Immigrants help make New York City the best city in the world—and as the daughter of Colombian immigrants, I will stand up for our immigrant communities every single day." “There is an entrenched culture of misogyny in Albany. It's been a boy's club for too long and we can start changing that culture by electing more women to office." In Jessica's district in Queens, lack of health insurance and preventative care plagues the community—and people of color in particular. Jessica will fight for stronger healthcare and access to healthcare facilities for the people in her community, and she will stand up for of healthcare workers' rights. Jessica proudly supporters single-payer healthcare, better unionization for healthcare workers, and greater funding for public hospitals. "New Yorkers need access to affordable healthcare—and this starts with a healthcare system that puts patients over profits." Jessica Ramos was born organizing and will die organizing. She spent a near decade working in the labor movement, and will stand up for labor rights in Albany. Jessica believes we must go beyond the minimum wage, and hold companies accountable that make billions of dollars while paying minimum wage with no benefits. She is tired of seeing our public dollars subsidize big corporations' payroll—and she will fight to make sure every workers' right to a voice on the job is protected, including farm workers. And she will work to protect New York's workers from the Janus decision and from Work for Less laws. "I've spent my entire career fighting for working people, and I'm not done yet. I believe every individual should have access to a good, union job so they can provide shelter, food, and clothing for themselves and their families."